Bandai Namco’s newest Dragon Ball FighterZ trailer shows off Android 17’s moves, the DLC fighter that’s releasing with Cooler this month. A character who was previously only seen as an assist for Android 18, Android 17 will soon separate from his Android sibling and have his own playable form in Dragon Ball FighterZ. Arriving alongside Frieza’s brother, Cooler, on Sept. 27, Android 17 was previewed by Bandai Namco with in-game screenshots days ago ahead of the new trailer above that showcases some of his moves. Three of Android 17’s core abilities were shown off in the trailer, moves that we’ve known he’d have but now get to see in action. Using the Android’s signature green energy attacks, his Android Barrier looks to be one of his go-to moves, a defensive ability that appears to allow for an immediate counter if timed correctly, similar to how some of Hit’s abilities work. End Game is also shown midway through the trailer, an ability that consists of a flurry of attacks with a finishing move if the first hit can connect. Like other trailers, the Android 17 showcase reaches its peak by showing his ultimate move, the Super Electric Strike. This move lets Android 17 harness his green energy in both hands before whirling around and hitting his opponent repeatedly. Android 17 has a variety of other energy-based attacks that weren’t shown off in the trailer but are expected to be included in his full kit once all his abilities are revealed. And now the moment you've been waiting for: Universe 7‘s MVP, the one and only Android 17 joins the fight! 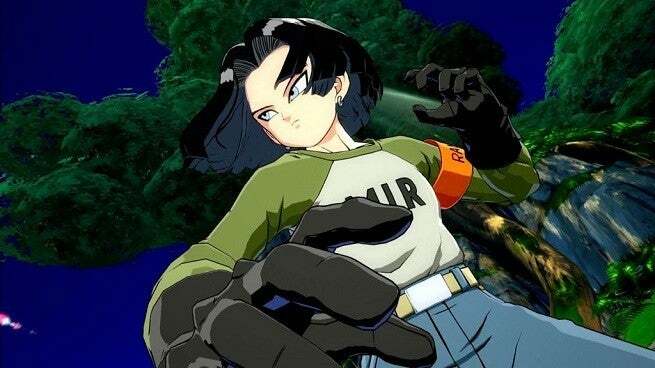 The eighth and final Dragon Ball FighterZ character to be released for now, Android 17 is joined on Sept. 27 by Cooler, a member of the Frieza Clan who sought revenge for his brother’s death. Revealed before Android 17 as a DLC character, Cooler’s already gotten his trailer with an even better look at his abilities coming after that. Two Dragon Ball FighterZ pros, Chris "HellPockets" Fields and Maximilian “Maximilian Dood” Christiansen, broke down Cooler’s moves in one of Bandai Namco’s videos and explained how his playstyle works, that video seen here for those interested in playing as Cooler. Both Android 17 and Cooler will be included in the game’s season pass and can be purchased on Sept. 27 for $5 each for those who don’t have the pass.